Fortis Escorts Heart Institute, formerly known as Escorts Heart Institute and Research Centre, is a pioneer in the field of fully dedicated cardiac care in India. It is the largest free standing private cardiac hospital in Asia Pacific region, and a part of Fortis Healthcare which is the fastest growing hospital network in India. 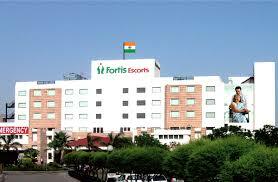 Fortis Healthcare with the vision of creating an integrated healthcare delivery system in India acquired Escorts Heart Institute and Research Centre Ltd. in 2005. Established in 1988, Escorts celebrated 25 years of Cardiac excellence in 2013. Fortis Escorts Heart Institute has set benchmarks in cardiac care with Paediatric path breaking work over the past 25 years. Today, it is recognised world over as a centre of excellence providing the latest technology in Cardiac Bypass Surgery, Interventional Cardiology, Non-invasive Cardiology, Paediatric Cardiology and Paediatric Cardiac Surgery. The hospital is backed by the most advanced laboratories performing complete range of investigative tests in the field of Nuclear Medicine, Radiology, Biochemistry, Haematology, Transfusion Medicine and Microbiology.